Most people consider milk thistle a pesky weed because it can grow tall and thorny, making it hard to even get near. However, it is loaded with medicinal benefits. The U.S. National Cancer Institute reports that milk thistle contains the active ingredient silymarin, which is used to treat liver and gallbladder problems and is an antioxidant that protects the cells against damage. The silymarin from milk thistle is in the seeds, which are used to make extracts or tinctures for medicinal use. If you have milk thistle growing near you, you can harvest your own seeds. You can also cook and eat the leaves and flower heads. Put on heavy gloves and protective clothing. Take your scissors and cut the flower heads when they are young if you wish to eat them. Simply boil or steam them until they are tender. Cut the young leaves from the stalk and steam them as you would spinach. If you simply want to harvest the milk thistle seeds, go on to Step 4. Wait for the seed heads to turn brown. Cut the seed heads off the milk thistle plant and place them in a paper bag. Store it in a cool, dry spot for 48 hours. Lay a window screen on a counter. Take one seed head at a time and carefully brush the seeds out of the head and onto the screen. Remove any debris from the seeds. Place the cleaned seeds in a glass jar or sealed plastic container. Grind up milk thistle seeds and use them to make a hot tea. Or add them to the tea brew. 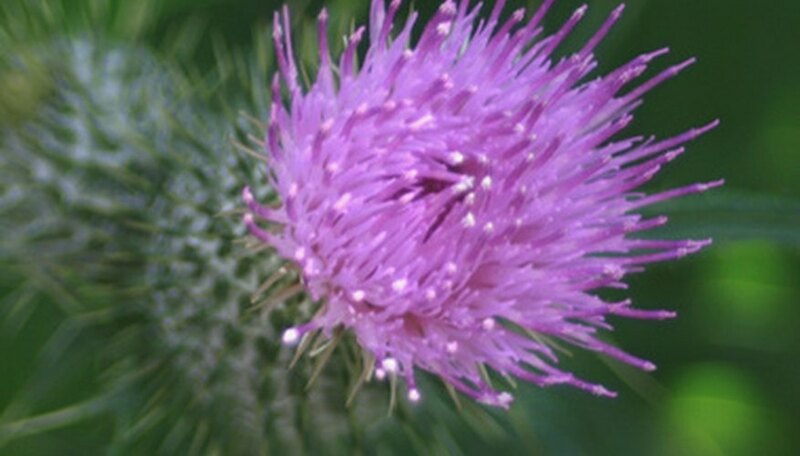 Milk thistle has potent medicinal properties. Check with your physician before consuming it in any form, especially if you are on any medication.